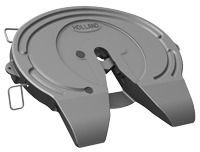 HOLLAND Heavy- and Severe-Duty fifth wheels have been the world standard for over 50 years. Globally recognized for unmatched strength and durability, these fifth wheels utilize proven heavy duty cast steel construction, with enhanced metalurgy and robust rib structure. Larger capacity fifth wheels for various operating conditions and applications. Type “A” lock with slack adjustment bolt, and front and swinging locks. Note: The FW0165 Series top plate is a reinforced version of the FW0100. 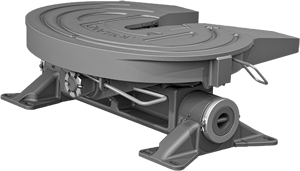 A heavy duty oscillating fifth wheel designed to operate on rough and uneven terrain.